The SH techs came today for installation and realised that my connection point (far from my TV) has only one LAN point so they cant activate my plan. They said that the Fiber TV needs to be wired to the ONT box via RJ45 directly. I cannot run internet from ONT to my router and then connect the fiber box to the router. I only have a single LAN run from ONT area to my TV and its physically far away. I can't understand why the fiber tv box must connect to the ONT Box and not any LAN point with internet gateway. I now have been asked to switch my TV box to the normal coaxial one. Starhub Fibre TV STB (Set top box) has to wired connected to ONT Port-2 only. While ONT Port-1 is for Internet/router which cannot be mixed with TV service. If you take Fibre TV you can request for 1 trunking/conversion which is Free in most case. Even if you go back to cable coaxial STB this cable network will cease in end June 2019, and not sure if they allow or not. I took a look at ethernet over coxial and this dont work for my network as the ont box is far from the utility box. Would you know if LAN power plug will work? Get contractor to run another Cat.6 Lan cable from ONT to TV. You mean powerline adapters, yes it is possible it would works. Have you try to check with Starhub on options available to you which they may include powerline beside EOCC adapters. However it may be possible to use 1 ethernet cabling for both Internet & TV services but with complicate settings & devices such as 2 Managed Switches. You can use two managed/smart switches to do vlan trunking. Essentially lets you send two separate networks down the same wire without mixing them. Try looking for the Mikrotik RB260GS (you will need 2 units, one at each end). Honestly such trunking is thin and small so you have no problem. And ONT Port 2 to RB260GS and RB260GS to the same LAN Point. Can I use any other gigabit switch / hub i.e. those DLink type? Or has to be this particular one? This Mikrotik RB260GS is a manage switch itself, beside there are other types. 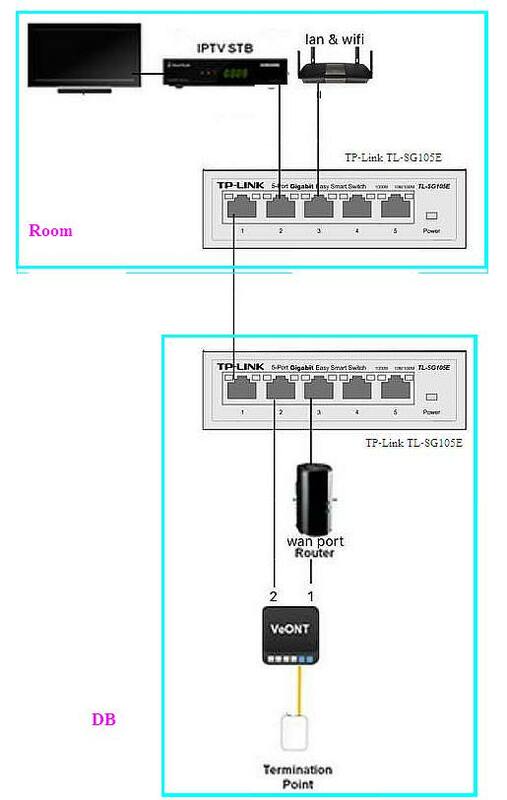 Example of the layout with TP-Link managed switches at both end of the lan/data points. In the section "Managed" it also provide a list of managed switches, including "TP-Link 5-Port Gigabit Ethernet Web Managed Easy Smart Switch". For more detail refer to my post #6 on the 2nd link "Starhub IPTV in Switched network". 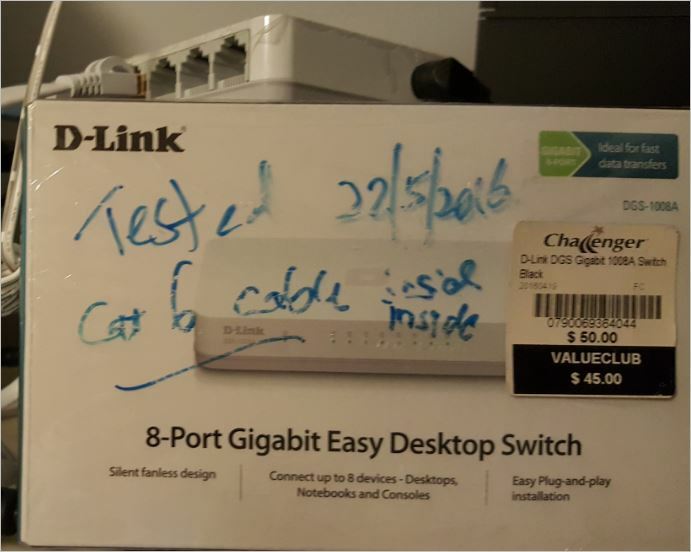 As in section on "Unmanaged" i have this > "D-Link 8 Port Gigabit Unmanaged Desktop Switch". Since you could use this for the STB in the bedroom with cable coaxial point.